lassical Indian concert notes do not usually print the names of the items which the musicians will perform. 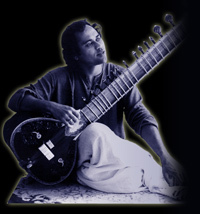 The performers often choose the ragas according to their mood, or the inspiration of the moment, season or time of day. This spontaneity is highly prized. When asked: "what is a raga?" we are left with a host of different answers. The first, of course is "the improvised pieces that Indian musicians play". Another, strictly technical, defines a raga as a cross between a music composition and a scale. A more poetic definition is "the melody which haunts you." Each raga has a set of rules, a pattern for ascending, descending, beginning, ending and resting, a king note, a minister note, a sub minister note, a heart, a mood, and an enemy note. Imaginative musicians create melodic and rhythmic combinations that seem to pour forth effortlessly as they color the mind with the bright tones of the raga. Performances usually begin with an alap, a meditative extended improvisation without a fixed rhythm. This may be followed by jor and jhala, in which a pulse is introduced and the tempo increases in speed. In the next section the vilambit gat (traditional composition) starts, and the tabla player begins. At this point the two musicians take turns with their improvisations, with the tabla player mimicking or amplifying the ideas of the instrumentalist. The next two sections, known as fast gat and jhala, move with an increasingly fast tempo, ending with a final climax of a tihai, the traditional form of a catchy phrase repeated three times and ending on the first beat of the rhythmic cycle. Ragas in the later part of the performance are called "light classical" or thumari. They are more romantic, less rule-bound, changeable, emotional and delicate. Light ragas should be full of intricate ornament, poignant feeling and charm. Musicians who are especially good in thumari are much admired.